What are the physical changes that affect exercise during pregnancy? Which exercises to avoid during pregnancy? How can exercises benefit your pregnancy? Exercising helps you stay fit. It is good for your heart, body, and mind. But when you are pregnant, it might all change. You do not know if you should continue to exercise or take a break until you deliver your baby. The fears are understandable because you do not want to take a risk by doing the wrong exercises. Therefore, MomJunction helps you know about what exercises should be avoided during pregnancy, when to stop exercising and more. Yes. Exercising is safe for both the mother and the fetus. In fact, you need to work out regularly during this time, even if you did not have a fitness routine previously. However, consult your doctor before chalking out an exercise regime. Since the body undergoes several physical changes during pregnancy, it is necessary to choose the activities that are in sync with the changes. The ligaments and joints loosen up due to the pregnancy hormones. The relaxed joints are prone to injuries during exercise. A strenuous schedule will increase your heart rate. The decrease in blood pressure causes light-headedness and dizziness. Your growing tummy alters the body’s center of gravity, making you less stable. You may note that we are not asking you to abstain from exercising. You need to exercise but engage in activities that are comfortable for you to perform. And when your body sends you a signal that it can’t take it anymore, stop immediately. Talk to your doctor if these symptoms persist even after you have stopped doing the physical activities. Also, before you chalk out your exercise plan, you need to know about the activities that SHOULD NOT figure in your list. During pregnancy, avoid doing crunches or sit-ups. Since your body is already stretched, you might not like to stretch it further (1). This exercise is not good after the first trimester (2). It puts stress on your lower back, which is not good during pregnancy. During pregnancy, your heart works hard to meet the increased demand for blood. High-intensity interval workouts increase the heart beat, thereby putting pressure on your heart. Your heart rate should not go beyond 140 beats per minute (3). Any high impact or contact sports should be strictly avoided during pregnancy, especially towards the later stages of pregnancy. Engaging in such sports activities can lead to injuries. If you are in the second or third trimester, do not do exercises by lying on your back. This position can result in supine hypertension syndrome, which is associated with the symptoms like low blood pressure and dizziness. Avoid engaging in exercises like deep sumo squats and sumo deadlifts as they can result in injuries and backache. Hot yoga leads to overheating of the body, which is not good during pregnancy. Avoid exercising in hot and humid conditions as it overheats the body, leading to heat stress and adverse effects such as neural tube defects (4) in the developing babies. However, you can try other yoga poses that are safe during pregnancy. 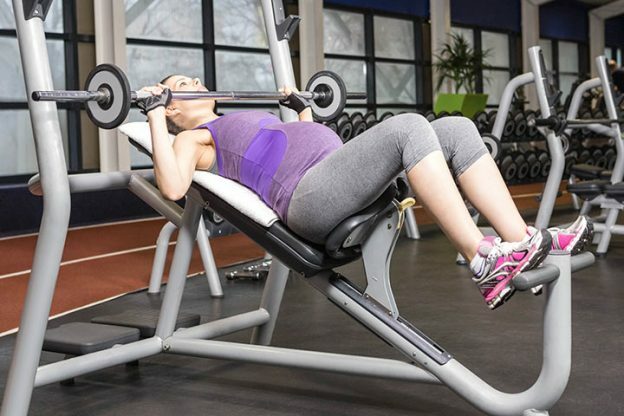 Lifting weights is a strict no during pregnancy because it can lead to musculoskeletal stress and cardiovascular issues. Though rare, it could result in pre-term babies (5). Avoid engaging in activities such as scuba diving. Though not proved, diving poses the risk of birth defects in your unborn baby (6). Although moderate exercises are good, strenuous aerobic workouts should be avoided during pregnancy, especially if you have a heart disease, severe anemia, or persistent bleeding in the second or third trimester. Some other exercises to avoid while pregnant include the ones that involve lying on the stomach, backbends, tai chi, and movements involving extension of joints. The one simple rule: You must feel comfortable while doing an exercise. If you feel uneasy, then stop and take a break. Yes, we say a ‘break’ because you need not stop exercising completely, as it is good for you in more ways than one. Reduces discomfort during pregnancy: Regular exercising is important to help strengthen your muscles. Also, it helps your body cope with the pains and other discomforts. Light exercises like walking, stretching, and yoga help ease back pain, strengthen your abdominal muscles, and improve blood circulation. Boosts your energy levels: Regular exercise enhances your energy level and helps do your daily tasks (7). Working out strengthens your cardiovascular system. With toned muscles, you can have an active lifestyle. Makes you sleep better: As your pregnancy proceeds, you may find trouble sleeping through the night. However, engaging in regular physical activities will help you get a sound sleep (8). Reduces stress: During pregnancy, hormonal changes bring in mood swings and leave you stressful. A regular exercise routine keeps stress at bay. Moreover, interacting with other pregnant women during your workout sessions could be a great stress-buster. Builds your confidence: You would have several doubts about your ability to deliver a baby. You might have fears about your pregnancy and the health of the fetus. Exercise makes you overcome all such emotions as it builds confidence in you. Helps prepare for childbirth: Childbirth requires stamina and you can gain this through regular exercises during pregnancy. If you stay in shape, your labor can ease up and the delivery time gets reduced. 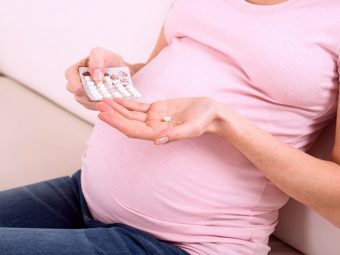 Reduces the risk of complications during pregnancy: Regular exercising during pregnancy can lower the chances of developing preeclampsia (pregnancy induced high blood pressure). If you have this condition, then talk to your doctor. Based on your physical condition, the doctor might advise you on your routine. Prevents gestational diabetes (GD): Exercising reduces the chance of getting GD by 36% (9) by keeping blood sugar levels in check. Supports fetal brain development: Studies have shown that exercises support brain development of the fetus (10). Helps regain pre-pregnancy weight post delivery: While you are engaged in physical activities, you gain strength, and your muscles get toned. 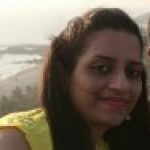 This helps you bounce back to normal state after childbirth. Moreover, there are few chances of putting on excess weight. Before you start a fitness regime, you need to know about the safety precautions that should be taken. In the case of medical issues such as diabetes or heart disease, take medical advice before you begin any exercise. If you are having any pregnancy related conditions such as low placenta, history of premature birth, a weakened cervix, bleeding and spotting, etc. your doctor will tell you about the exercises that you need to avoid, and those that are safe. Try to stick to light physical activities throughout the day without causing any exertion to your body. Instead of coming up with your own fitness routine, seek professional guidance for the activities to be effective and safe. Do not begin directly with difficult exercises as you could harm your muscles and ligaments. Start with warm-ups. For example, if you are walking, walk slowly for the first few minutes and gradually pick up the pace. If you are a fitness freak, give up your favorite exercises for a while because the safety of your baby is more important than anything else. Once your body is ready post-delivery, you can get back to your favorite workout regimen. Until then, it is better to play safe. Share your experiences on exercising during pregnancy by leaving a comment here.